Hey friends! I made a yummy lunch earlier this week on a day I was working from home that I wanted to share, in case you need some lunchtime inspiration! To make this masterpiece yourself, grab a wrap (these are black rice wraps, but any wrap will work), then layer on hummus, chicken, sauerkraut, dijon mustard, and greens. Sounds gross, tastes awesome – you guys know that’s how I roll. I had it with some string beans and an unpictured orange on the side. :) I wrapped it up in foil because the wrap kind of fell apart on me, so this way it was less messy! 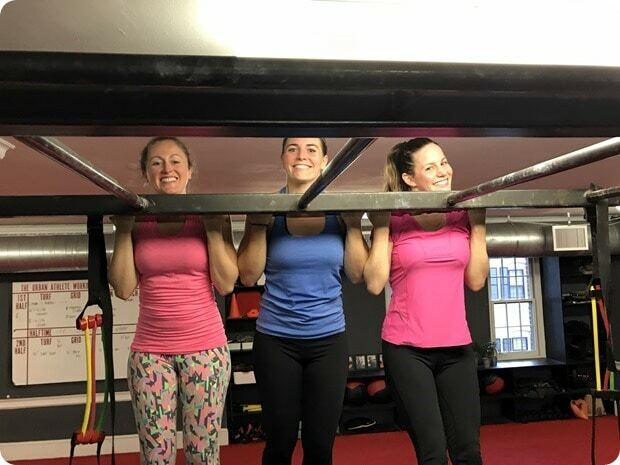 I will leave you with this fun photo from yesterday’s workout at Urban Athletic Club with the girls – we were cracking up because Kathleen looks like a chin up model with her tilted head! Lol! I know you can’t see our feet, but I swear we were holding this! Love those ladies. :) Workout buddies are the best! I’m keeping it short today because I have to rush off to a meeting in a few minutes – have a great day guys! What’s your favorite lunch wrap combination? Ooo I always forget about sauerkraut, but I need to get back on that train. Also, black rice wraps? Those sound intriguing and yummy. 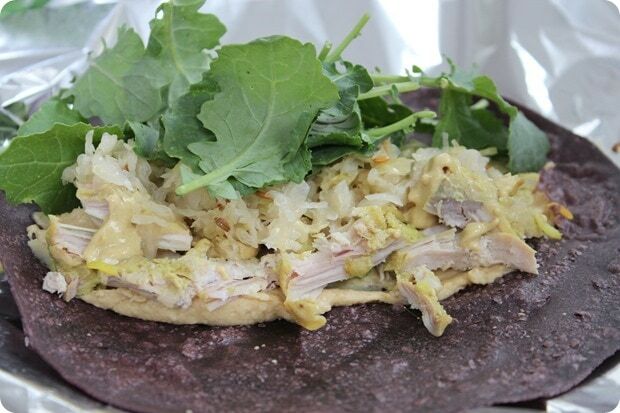 My favorite combo is probably chicken and avocado mashed up with cheese and arugula! Ehhh the wrap was kind of tough and fell apart, which is why I didn’t talk more about it – not sure if that’s my fault, though, because they were frozen and I quickly defrosted in the microwave? Chin up model fail… note to self: Get feet in shot so people can tell we’re actually working out!! Lol it totally looks like we’re standing on something, doesn’t it?! Yum! I’ve been eating turkey / hummus wraps on Ezekial wraps this week. I love adding avocado and sunflower seeds and / or shredded carrots for a little crunch. Good idea to wrap it in foil! I tend to overstuff mine and the contents spill out everywhere…. 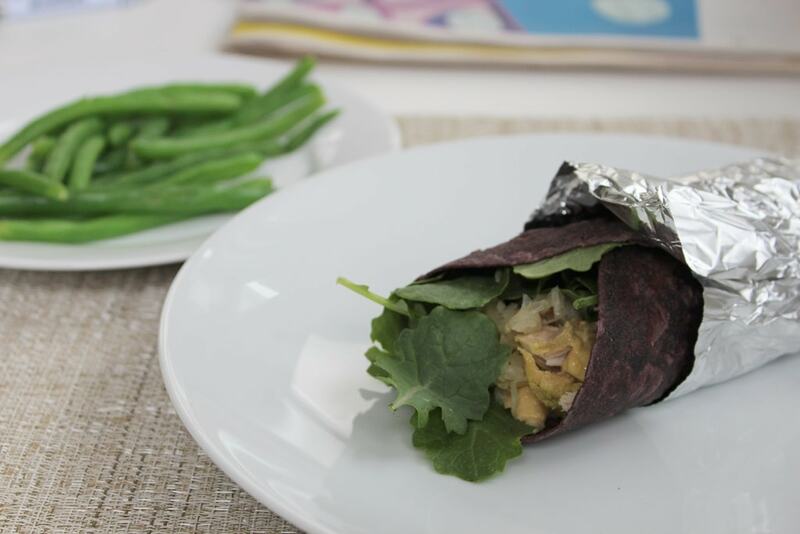 I love a good wrap, such a quick and yummy lunch. Thanks for the new combo idea! Sometimes the food combos that sound the weirdest taste the best….at least that’s been my experience. 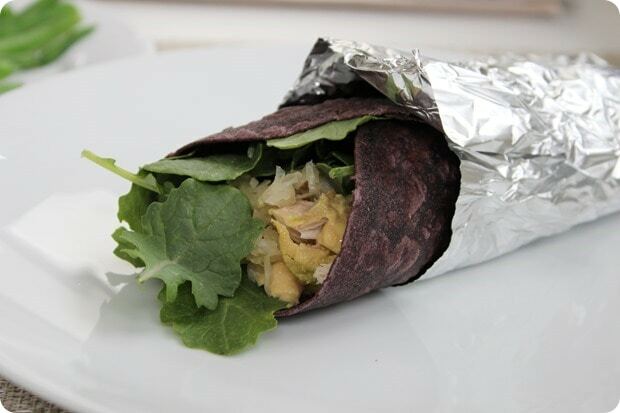 :) This wrap looks delicious, can’t wait to try it!